Do you know what this picture shows? 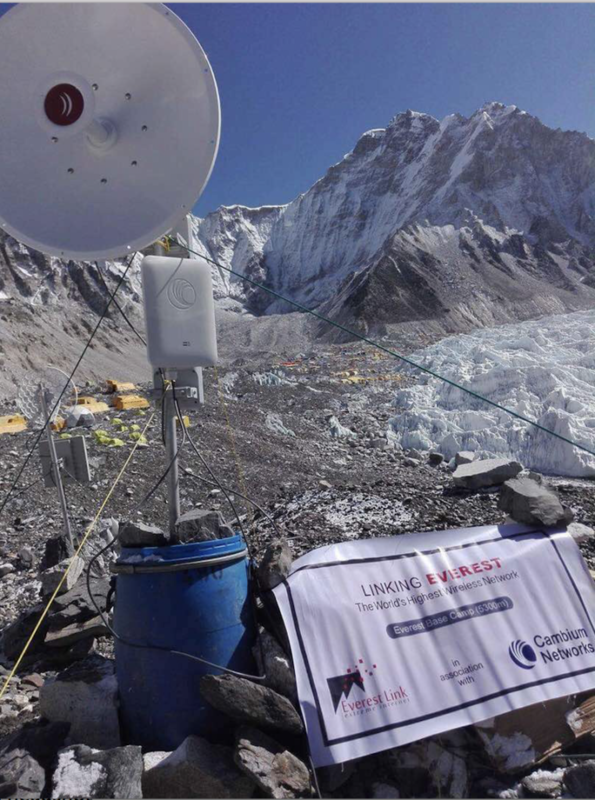 Wi-Fi – available on the tallest place on Earth, Mount Everest. Only Cambium Networks can make that possible. But no one would have known about it if it weren’t for their PR efforts. In 2017, Cambium Networks asked its PR agency of record, Bospar, to build brand awareness of the company as a leader in the wireless broadband space among key vertical media and top-tier business media, generate visibility for the company’s growing portfolio of solutions, and promote key customer stories to help achieve business goals, including an increase in customers, market share and 50 percent YoY revenue growth. Cambium Networks also wanted to improve its employee and partner training programs and tapped PR to develop a series of trainings. Bospar commissioned third-party research examining Americans’ views on the quality, price and reliability of their Wi-Fi and the places and times that they need reliable Wi-Fi. PR paired data with the development of an industry white paper on understanding 5G and steps operators should take before deploying 5G to help establish Cambium’s leadership on the topic and set the stage for subsequent announcements of 5G customer success stories, executive visibility and thought leadership. PR also pushed out multiple announcements to achieve maximum visibility of the company milestones and set up the need for new products, including cnPilot and ePMP. PR worked with Cambium Networks to develop customer case studies and corporate social responsibility stories. PR also worked with Cambium Networks on a CEO thought leadership program, including the development of blog posts that were pitched and placed in vertical and technology outlets before appearing on the Cambium Networks site. PR developed and presented a comprehensive training program for Cambium Networks employees and partners on how to leverage social media channels to increase Cambium Networks awareness. PR developed and executed an analyst relations program, conducting outreach to more than 30 key industry analysts at Gartner, IDC, Forrester, Frost & Sullivan, Ovum, ARC, and Enterprise Management Associates to set up introductory briefings with Cambium Networks subject matter experts, provide them with an overview of the product portfolio and new announcements, and pursue inclusion in relevant industry research. PR conducted outreach to vertical wireless broadband media, top-tier consumer, business and tech media, and local and national broadcast media. In 2017, Cambium Networks saw an increase in new customers and an increase in revenue. The company also bolstered its employee and partner training programs with Bospar’s contributions, leading to an increase in social media activity by employees and partners that raises Cambium’s social profile. PR secured over 181 pieces of coverage and over 90 million impressions. PR developed and executed an analyst relations program, conducting briefings to more than 30 industry analysts at Gartner, IDC, Forrester, Frost & Sullivan, Ovum, ARC, and Enterprise Management Associates. PR increased Cambium’s media exposure by 337% YoY. PR worked with Cambium Networks on a multi-pronged approach that leveraged new research that Cambium owned and included the development of an industry white paper, a CEO thought leadership program, and key pieces of collateral, including customer case studies, to generate placements in vertical media and top-tier business, technology and consumer outlets. PR also developed multiple social media training presentations tailored for different audiences.